Emerald: Police and Boko Haram clash: 9 dead, 2 arrested. 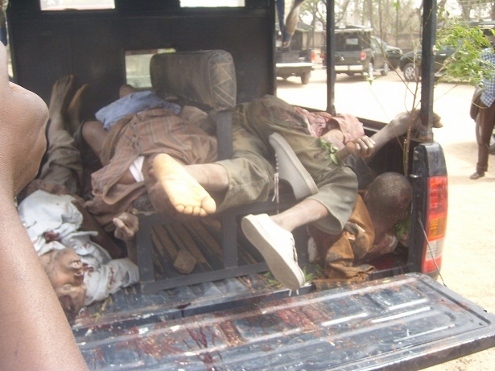 Police and Boko Haram clash: 9 dead, 2 arrested. The terrorists attacked a Divisional Police Officer’s house, police station and Unity Bank. The dreaded Islamic militants came on three vehicles at about 2 a.m., broke into the armoury of Tudun Wada Police station bombed the station and carted away arms and ammunition. Security forces claimed no life was lost on their side, as nine Boko Haram men were gunned down while two were arrested alive during a gun battle that lasted for five hours. Tudun Wada is about 100 kilometers away from Kano metropolis. The Brigade Commander of 3 Brigade (Bukavu Barracks), Brigadier-General Illyasu Abbah briefed newsmen this evening. He said the operation was a major breakthrough for Kano Joint Security Task Force. According to him, the Islamic militants in search of guns and money attacked a Unity Bank adjacent to the bombed police station, “but they did not succeed in breaking into the vault containing about N2 million. “Within the hours of 2 and 7 a.m. on Wednesday, hoodlums went to Tudun Wada which is about 100 kilometers from Kano. They used explosives to blow up the police station in the area. “They destroyed the DPO’s house, went to the police station and did the same. They also used explosives to blow up Unity Bank adjacent the police station,” the Army Chief told journalists, adding that the Islamic militants carted away rifles from the bombed police station. The Army boss said during the gun-duel, the JTF over-powered members of the sect who came in three cars, and recovered the arms and ammunition stolen from the destroyed police station.